Saint Canutus, King of Denmark, was endowed with excellent qualities of both mind and body. As a young prince, he cleared the seas of pirates and subdued several neighboring provinces which were harassing Denmark by their incursions. His courage rivaled in excellence with his ability in the conduct and skills of war, but his singular piety, in a time when few of his land were Christian, eclipsed all his other endowments. Saint Canutus succeeded his elder brother Harold on the throne of Denmark in the year 1080. He began his reign by a successful war against the troublesome, barbarous enemies of the state, and by planting the faith in the conquered provinces. Amid the glory of his victories he humbly prostrated himself at the foot of the crucifix, laying there his diadem, and offering himself and his kingdom to the King of kings. After having provided for the peace and safety of his country, he married Eltha, daughter of Robert, Earl of Flanders, who proved herself a spouse worthy of him. They are the parents of Blessed Charles, Count of Amiens and Flanders, a martyr for his faith, brutally slain like his father, while in prayer. The justice of Saint Canutus as sovereign became evident when he condemned to death a Danish lord whose vessel, to sustain the owner's luxury, had pillaged the ship of a neighboring country and massacred the crew. He applied himself to the reform of all internal abuses. For this purpose he enacted severe but necessary laws for the strict administration of justice, the repression of violence and tyranny by the powerful, without respect to persons. He favored and honored holy men, and granted many privileges and immunities to the clergy. His charity and tenderness towards his subjects made him study all possible ways to make them a happy people. He showed a royal munificence in building and adorning churches, and gave the crown which he wore, of very great value, to a church in his capital and place of residence, where the kings of Denmark are still buried. To the virtues which constitute a great king, Canutus added those which prove the great Saint. A rebellion having sprung up in his kingdom, the king was surprised at church by the rebels. Perceiving his danger, he confessed his sins at the foot of the altar and received Holy Communion. 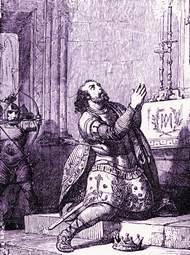 Stretching out his arms before the altar, the Saint fervently recommended his soul to his Creator; in this posture he was struck down on his knees by the enemies of his Christian reign. Reflection. The soul of a man is endowed with many noble powers, and feels a keen joy in their exercise; but the keenest joy we are capable of knowing consists in prostrating all our powers of mind and heart in humble adoration before the majesty of God.